Go beyond Last Click Interaction analysis of marketing campaigns by learning how to use three key reports provided by Google Analytics: Assisted Conversions, Model Comparison Tool & Top Conversion Paths. Though Last Click Interaction analysis is very useful for finding ways to optimize marketing campaigns in order to improve their results, it doesn’t give us the full picture. You’re limited to a single channel or source of traffic when you should be looking at an overview of how they all interact and support each other. Here’s how you can take your analysis skills to the next level, by using three key reports provided by Google Analytics. This report provides information regarding how often channels, sources & campaigns a user interacts with on his journey to completing a conversion, but are not the final conversion interaction. The more Assisted Conversions a channel/source/campaign has, the higher level of importance it has in the conversion path. However, the report provides an even more interesting insight: the value of a traffic source in the conversion path. Remember that the conversion path does not begin and end with the last traffic source a user interacted with before completing a conversion. Often, a user looking to purchase a product or a service will first research and compare multiple offers before making the final decision. And during this process that user can interact with multiple channels, not just one. We can see in the example above that Organic & Paid Search are channels which work equally with both assist and final interaction roles. However, Email, Social Network and Display more often assist users on their conversion path and are fewer times the final channel which drives the conversion. And though there isn’t enough data to make a decision whether the Display & Social Network channels are helpful, it’s clear that Email is highly important in driving users back to the site and keeping them engaged and interested. 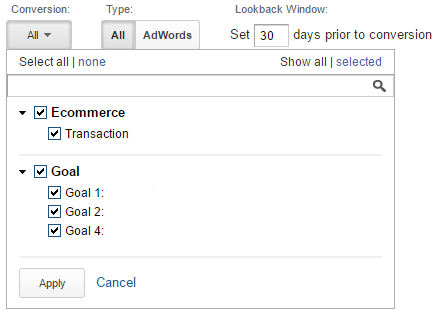 * Tip: You can segment the data you’re analyzing by Conversion Type (Transactions / Goals), Traffic Type (All / AdWords) & Lookback Window. Or you can apply Conversion Segments, either the defaults available or ones you create. After analyzing the importance of traffic sources in the journey to conversion, dive deeper and check on which step on the path they are most helpful, which sources are the starting points for users, which keep them engaged and which drive the conversions home. 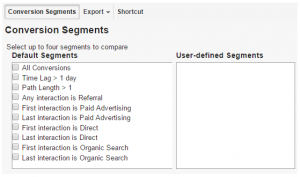 By default, Google Analytics attributes a conversion to the last non-direct traffic source a user interacts with before converting on the site. Use this tool to check results per channel/source/campaign when a different attribution model is applied. Compare up to three models at a time to determine on which step of the conversion journey a certain traffic source is most valuable. In this case, we observe a high increase of 42.56% in conversions, for Referral, when comparing First Interaction vs Last Interaction, and a smaller increase of 13.56% when comparing Time Decay vs Last Interaction. This tells us the channel is valuable in getting users started on the path to converting, getting them to interact with the site and keeping them engaged. Similar to Referral is the Display channel. Though the increase in conversions when comparing First Interaction vs Last Interaction is not as high as for referral, only 35.38%, it is still important in attracting potential customers and introducing them to the site & brand. 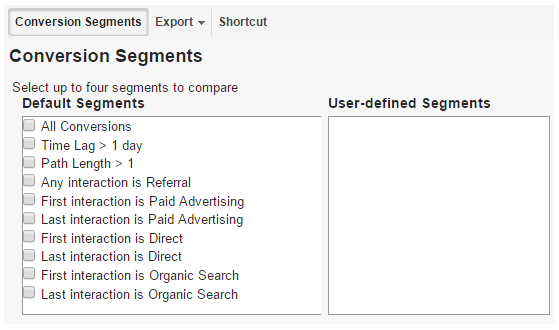 *Tip: The segmenting options mentioned for the Assisted Conversions report are available in Attribution as well. Dive even deeper into the user’s journey to conversion and take a look at the actual paths that lead them to your site and through to the final step of the checkout flow. In this report you’ll be able to see not only the channels/sources/campaigns a user interacted with but also the order in which he engaged with them and how many times. The screenshots above are just a few examples of conversion paths. Users can interact with one or two channels or all channels multiple times before converting. *Tip: In addition to the segmenting options available for the previous two reports, you can also select the length of the conversion paths you want to take a look at. So start using Google Analytics to its full potential and take a look at the data in your reports for insights into optimizing the spend of your marketing budget and improving the strategy to achieve your business goals. *Tip: Want to separate the results of your paid channels so you can better analyze their performance using these three reports? 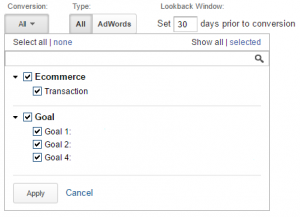 Then create your own channel grouping in Analytics and apply them to the reports. Don’t know how to create a custom channel grouping? Read all about it in our article Why It’s Important to Define Your Own Channels in Google Analytics. Need help analyzing and interpreting data in your Google Analytics account? Take a look at services tailored to your needs here. What are the most important search engine ranking factors? Get notified for new articles!